Independence Day Halter Tutu Dress, Sizes Nb-24 Months, 2-6t. Free Usa Shipping. Custom Order. This dress comes with a 6" or 8" halter top in white, red, or royal blue. Please select your color halter top and size when checking out. 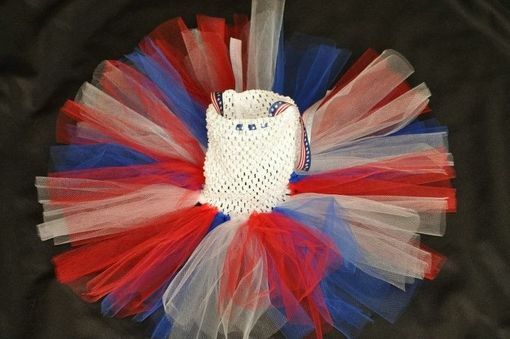 This dress includes red, royal blue, and white tulle at 8" long for nb-24 month size and 11" long for 2-6t size, with flag ribbon if available. Please contact me for other custom orders. This can be made in a variety of combinations. I do offer a discount when you purchase multiples, contact me for a custom order listing. I offer $2 discount for each additional dress.